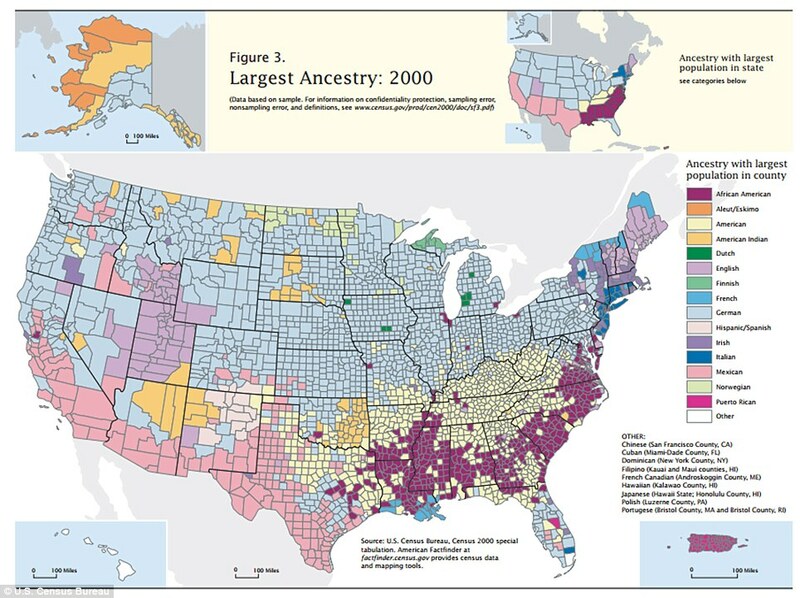 This map shows the predominant ancestry of every county in the country, based on data gathered in the 2000 US census. As a measure of the prevalence and persistence of ancestral identification, the map is fascinating and surprising. Many of us are invisible on this map: we are minorities within majorities. In that sense, the map hides diversity rather than exposing it, but, even so, the level of diversity and homogeneity within the states is striking. Every color on the map has its history, its presence traceable back to a movement of people that may have happened hundreds of years ago. Such old migration patterns account for the concentrations of French people near the Canadian border in the Northeast and down around the mouth of the Mississippi, and for the concentrations of people of Finnish and Dutch descent in the areas of Michigan where they originally settled. Similarly, yet not so similarly, African-Americans, who collectively represent the second largest ethnic group in the country, remain heavily concentrated in the South, where whites first transported their ancestors to labor as slaves. Otherwise, blacks predominate in only a few urban areas, including Chicago, Detroit, and Cleveland. The map’s orange areas show where native Americans, who once roamed the continent, came to be sequestered, again at the will of white settlers who were ‘organizing’ the land. The thick band of pink along the nation’s southwestern border reflects the historical presence of Mexican peoples in that part of the country, as well as the contemporary migration from Mexico that is on-going. The prevalence of people of German ancestry throughout such a large part of the country is a surprise. Arriving in great numbers after 1848 as the nation was expanding, German immigrants put down roots where the availability of land presented opportunity. Whereas descendants of English colonists remain numerically concentrated in the Northeast, Americans of German descent are the most populous, accounting for about 50 million of the States’ total population (of roughly 310 million people). There are people who identify themselves solely as American, and they are concentrated in the upper South–in places like Arkansas, northern Texas, Kentucky, West Virginia, and Tennessee. People living in these regions are descended mainly from the earliest white settlers, and for them, the importance of their particular (mainly English, Scotch, and German) ancestry may have waned. According to Business Insider, claiming American ancestry may also be a way to assert a distinction vis-a-vis persons of other ancestries. Ancestral origin remains an important point of identification for the vast majority of Americans. Most Americans, regardless of color, rely on ancestry to know who they are and to place themselves in the national story. Without it, becomes more difficult to know who we are. If America is a melting pot, the melting bits within it are melting VERY slowly. The purdurance of our diverse origins is a big part of what defines American identity. On the other hand, many Americans don’t fall–or never fell–into any single category. That fact, coupled with the persistent potency of ancestral identification, may account for why the federal government has again begun changing the ways it categorizes race and ancestry, beginning with the 2010 US census. A fascinating map ! I’m going to try to make a large print of it !——-Also find it amazing that 50-million folks consider themselves part or all German. I too found that astonishing, and in general I loved seeing the anomalous ethnic patterns in some locales. I like a good map!